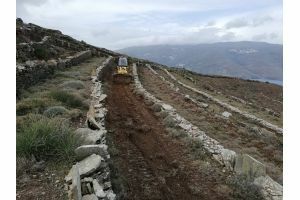 In the framework of the LIFE TERRACESCAPE project, the Municipality of Andros has been preparing and cultivating selected terraced fields for the last two months. The aim is the recultivation of terraces for producing high quality local products. The fields have been prepared properly, through the removal of Spanish broom and other low shrubs hindering their cultivation, and fenced. Plowing and sowing, by hand or with the use of mechanical means, followed. Most of the fields have been sown with the local Parian variety of barley and was combined with vetch, in cases of uncultivated areas, for the improvement of soil fertility. In addition, at smaller fields, malting barley has been sown, while sowing of local varieties of fava beans and onions will follow. The target set for the period 2018-2019 is the cultivation of 250 acres.